Being a bounty hunter or bail bondsman is one of the most dangerous careers you can pursue. Bounty hunters are responsible for finding, capturing and transporting dangerous, unpredictable and desperate criminals. They're often lone wolves or work in small teams-- they do not have the institutional support or significant back-up that military personnel and law enforcement officers can rely on. For this reason, if you're a bounty hunter, you need to take your personal protection very seriously. Not only do need to keep yourself safe to protect your livelihood, you have a duty to society to capture and control those that pose the most threat to peaceful citizens. There is no single situation that a bounty hunter routinely faces-- each person and case will throw different dangers in your direction. For this reason it's important to carefully consider each instance in which you might benefit from bullet proof armor. It may even be wise to purchase multiple vests so you have true flexibility when heading out for a job. A big part of locating a criminal and bringing them in will involve researching the individual's capabilities and tendencies. This important knowledge should also be used to determine what level of protection is best for this specific job. Perhaps you know the individual has access to heavy firearms, or you know that they're prone to sudden, desperate or improvised attacks when cornered in close quarters. Bullet proof vests are rated at different levels. The higher levels protect against higher caliber bullets fired at higher velocities. Levels IIa and II protect from most handguns and offer a great combination of comfort and protection. Level IIIa is the highest "soft plate" protection, and will protect you in high-risk situations from more uncommon weapons. Levels III and IV are considered hard-plate bullet proof armor and are generally not concealable because they require the use of a ceramic or metal plate, although recently bullet proof vest designers have developed covert plate carriers. This kind of bullet proof vest is capable of withstanding both handguns and rifles. Level IV armor can even withstand single shots from armor piercing rounds. The ballistic bullet proof vest rating is only one aspect to consider. You should also prepare for stab and spike attacks from blades, needles and shivs. These differ from ballistics because the fine, sharp point can pass right through bullet-resistant Kevlar. 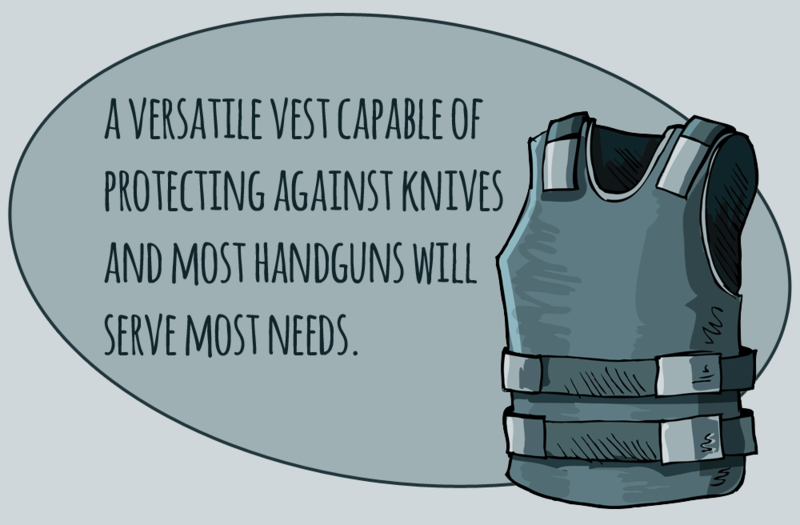 A stab-resistant bullet proof vest will be rated between levels I-III for stabs and/or spikes, with the higher levels protecting from sharper blades stabbed with higher force. Carrier is also something to consider. Covert carriers can be worn underneath clothing and will conceal the fact that you're wearing a bullet proof vest. These may be best in situations when you're still tracking a criminal and need to blend into a crowd or do not want to call attention to the fact you're ready for conflict. These carriers can only hold lighter, softer plates, so they may not be ideal if you believe you are at risk to face heavier weapons. Overt carriers can carry heavier plates and are worn on top of clothing. They often have straps and pockets which are useful, and are made of heavier, more durable material. There's no secret about wearing one of these though-- it will be obvious to anyone that sees you that you're wearing bullet proof armor. If you want your target to know that you're not messing around and are ready for anything, however, this might not be a bad thing. The fact is, there is no single vest that is recommended for all bounty hunters. In many cases, a versatile vest capable of protecting against knives and most handguns will serve most needs, especially if it can be concealed when stealth is strategically or tactically necessary. Only you will know what kind of dangers each job brings, because each criminal is different. It's important to remember that when being pursued by a bounty hunter, criminals become desperate and are prepared to do anything to preserve their freedom. Especially if you're pursuing a violent and dangerous target that has access to some heavy weapons, you may want to also have an overt carrier with some heavy plates in case things get hairy. Although not always possible, an arsenal of options is really the safest choice-- a covert , all purpose bullet proof vest for less dangerous jobs and reconnaissance or investigation, backed-up by hard-plate overt bullet armor when It's time to strap up and make a move on the bad guy. Tom has written a number of articles for SafeGuard Armor. He uses his expert knowledge and experience to provide information on choosing body armor for people working in different occupations, courtesy of SafeGuard Armor.